Well ... well ... well. Do you remember last week when Yours Truly blogged about the battles that raged: COMMANDOpera vs San Diego Opera *and* COMMANDOpera vs. Opera Lyra Ottawa? Indeed you do, Friendlies. Indeed, you do. Now, it would seem that A Liberal's Libretto is being punished. We've been sent to the naughty corner of the web, if you will, as we've been *blocked* from following COMMANDOpera on Twitter. 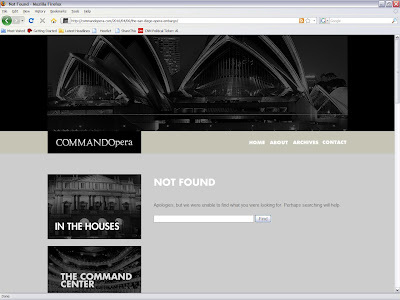 Now - going a step further in our research - we found that, as predicted, COMMANDOpera is further punishing A Liberal's Libretto by taking our name off of their 'Links' section - as they had also vowed to do with San Diego Opera. 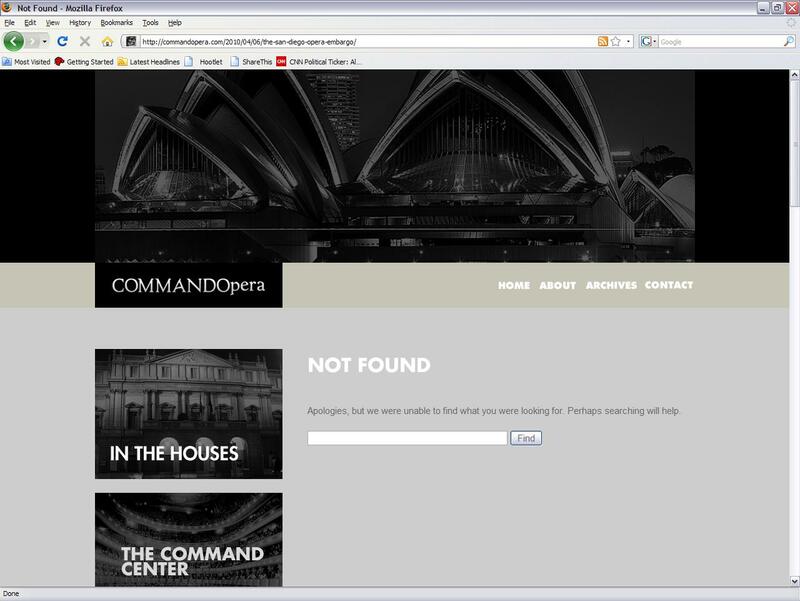 Beyond removing the announcement, COMMANDOpera removed the link to the San Diego Opera, and will no longer cover the theatre. ... The luxury to be seen on the pages of COMMANDOpera and read in over seventy countries is not a right, but rather at the elect disposition of Crew Mantle. Uncivilized and injurious behaviour to COMMANDOpera is untenable from any dominion and will not be tolerated. Let's sum this up, shall we? 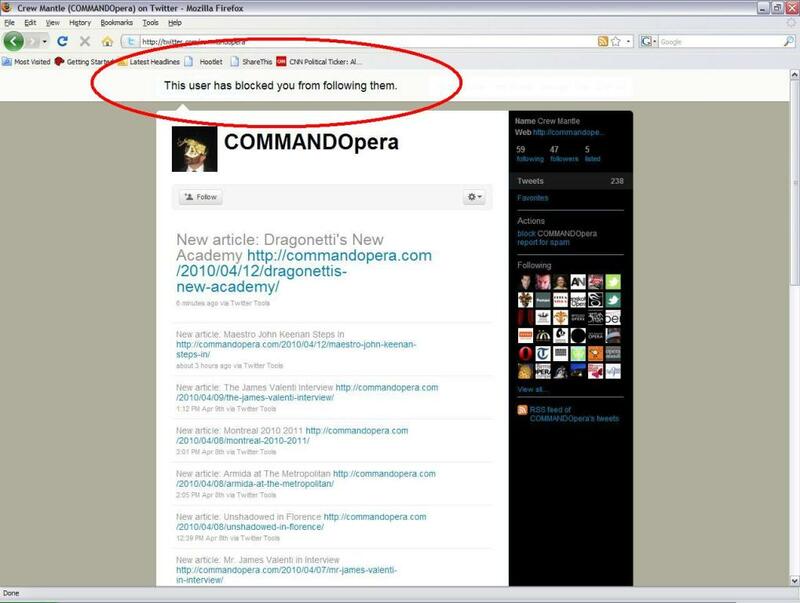 Yours Truly, @JNewmanNYC, has been blocked from following COMMANDOpera on Twitter ... AND, A Liberal's Libretto has been removed from the 'Links' section of COMMANDOpera. Not shocking. The sun will still rise and set tomorrow. But, I was wondering: what does COMMANDOpera feel is so scandalous that they had to remove the San Diego Opera Embargo post from their blog? I don't want to toot my own horn, but since A Liberal's Libretto is now the outcast-according-to-COMMANDOpera, it would appear that maybe ... just maybe ... my words had some impact on the upstart. You just never know. "Having slogged through the arts for about 30 years now, I've encountered countless people who behave like snivelling, petulant 7th graders. If one is not capable of growing even a moderately thick skin, one really should go sell shoes or something."